Why did I ride this? I first read this in December of last year and was so moved by it that I nominated it for the book group I am part of. So I reread it with a slightly different eye so that I could lead the discussion. I read Karls’ first book, Matterhorn, back in 2010 and so when a veteran and good writer writes something with a title like this I decided to read this. This is a look at how we as a society can better prepare people to be warriors and then support them better when they return from warfare. He looks at things in a physical, metaphysical, spiritual, psychological and practical sense. This is a book that should be read by everyone. It can be a difficult read as it has some frank discussions about what the author has experienced in combat. Why did I read this? I am trying to read all of the 2016 Pulitzer Prize winners and this is the winner for fiction. The main character is a communist spy who works on the staff of a South Vietnamese General. The story begins at the fall of Saigon in April 1975 and continues as the General, his family, staff and some friends are relocated to Southern California. There the General opens a liquor store, his wife a Pho restaurant and begins to plan for an army to return to Vietnam and overthrow the regime. The main character is half French and half Vietnamese and attended college in Southern California, and tends to see both sides of many things. He continues to report on the General’s activities to his communist handler, he also gets recruited to act as an adviser for a movie about the war, it bears an amazing resemblance to a movie starring Robert Duvall, Martin Sheen and Marlon Brando. He returns to Vietnam to overthrow the regime (wink, wink) and to protect a friend. He is captured and put in a reeducation camp and forced to write a confession, which it turns out is what we have been reading. Grade-A Nguyen’s writing style reminds me of Pat Conroy. This is a story filled with drama, pathos and friendship. Be warned there a couple of very graphic scenes, not just of battles but of interrogations. Five years ago I read a little book by Karl Marlantes called Matterhorn about a Marine in Vietnam. It was awesome to read and I gave an A++. Shortly after that he wrote this and I just now got around to reading it. This is an awesome book that explores spirituality, morality, ethics and more. It is a guide to how we can prepare our warriors to deal with the implications of war in so many areas. He uses his experience as a Marine and others and also a vast array of classical literature to make his points. Did I learn from it? I did indeed. It was very moving. I was reading a part of it while lunching and a passage made me stop chewing and put my fork done. There is so much here that would help us all. If I could afford it I would give a copy to all the people who make the decisions in Washington D.C. to sacrifice their young, physically, mentally, emotionally and in many other ways. Everyone should read this. What is with the title of the review? I feel that this is the most important book that I read this year and will influence my life going forward and I will be reading it again and again. Why did I pick this up? We are reading this for our May meeting of the Corner Reading Society. We are reading this in place of another book that there was some controversy about the veracity of the stories. What is the story? 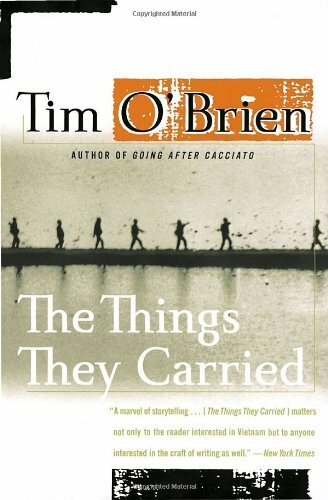 In a series of short stories Tim O’Brien uncovers the truth of the Vietnam experience through his eyes and those of those he served with. He tells stories of some experiences in country and in the aftermath of the war. The stories mingle humor, violence, friendship, faith and incompetence just like life. Did I enjoy it? Yes, many of the stories reminded me of the camaraderie that I experienced while I was in the Navy. He conveys a depth of love for his compatriots that only those who have served together can know. What is with the title of the review? All of these guys are still carrying things around with them, in their heads and and souls. Published in the form of an interview this memoir by Bui Tin covers his involvement in the Vietnam War as a part of the Army, and then his part in the reunification of Vietnam as a journalist and his eventual disillusionment with the government of Vietnam and his relocation to France. He remains a vocal critic of what the government is doing in Vietnam. He shows insight into the causes of the conflict in Vietnam with various other countries prior to the involvement of the United States, and what the original thoughts were in seeking independence. He shows why the North acted the way they did and how various hard liners have refused to give in even today. He speaks to mistakes made by both sides in the conflict and why the Vietnamese people were fighting so strenuously, how the governments on both sides made mistakes in their understanding of each other. Also how other communist superpowers made promises to the North and then reneged on them. He disagrees with the reeducation camps and how the communist government is only taking half measures in rebuilding and the governments mistrust of the United States. Did I enjoy it? Yes I had been searching for a book from this perspective for awhile (and will continue to) and enjoyed reading it. Multiple perspectives are always a good thing I think. What is with the title of the review? We each bring our inherent bias to any subject we look at. The Vietnam has been looked at from so many different perspectives that sometimes it seems like another version of Alice in Wonderland as she went through the looking glass.